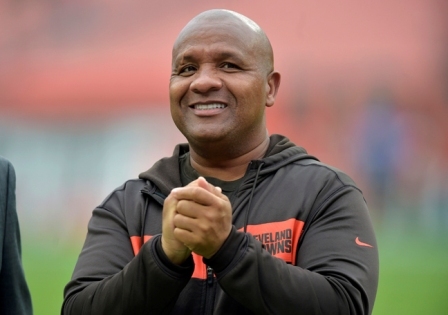 Hue Jackson needed only a few weeks to land another job in the place where he’s always welcomed. In his latest role, he'll help Lewis – a close friend – to try to fix the defense and save the season. Cincinnati (5-4) has lost three of its past four games and is on pace to give up the most yards in a season in NFL history. The Bengals have allowed 500 yards in three straight games, a first for any team in the Super Bowl era. Lewis hired Jackson in 2004 – his second season in Cincinnati – as receivers coach. He spent three years in the job before moving to the Falcons as offensive coordinator, developing a reputation for creativity. He was the Raiders’ offensive coordinator before moving up to head coach in 2011. Browns owner Jimmy Haslam fired Jackson after a 33-18 loss in Pittsburgh, Cleveland’s 25th consecutive road defeat. Jackson wasn't getting along with offensive coordinator Todd Haley, who also was fired. Even though Jackson will be working with the defense in his latest incarnation in Cincinnati, it'll create an awkward dynamic. Dalton developed a close relationship with Jackson, who helped him to his greatest success in the NFL. Bill Lazor is in his first full season as the Bengals’ offensive coordinator. The offense is missing receiver A.J. Green indefinitely with an injured toe on his right foot. The starting unit managed only one touchdown during a 51-14 loss to the Saints on Sunday at Paul Brown Stadium, even though New Orleans also has one of the league's worst defenses.